ABOVE: A ducking device at the Mittelalterliches Kriminalmuseum, or Medieval Crime Museum, in Rothenburg ODT. Whether you're a exhibitions enthusiast or just want to move your sightseeing indoors in bad weather, you'll find a good assortment of museums in Rothenburg ob der Tauber. The Kriminalmuseum, or Medieval Crime Museum, is well worth visiting for an hour or two. Its four floors of exhibits trace the development of European law over 1,000 years--and while the displays of torture devices can be grim, you'll also see such quirky exhibits as a "flute of disgrace" for bad musicians and a "neck violin" for pairs of quarrelsome women who needed help in seeing eye to eye. 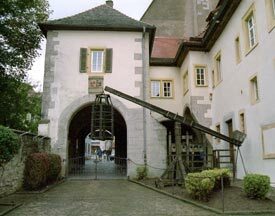 The Reichsstadtmuseum, or Imperial City Museum, occupies a 13th Century Dominican priory near the city walls. It has a good collection of artwork, armor, and historical items from various periods in the city's history, plus our two favorite exhibits: historical rooms from the building's convent days (including Germany's oldest preserved kitchen) and an extensive collection of Judaica that includes an ancient Jewish cemetery complete with gravestones.